Our entry into the sewers was via a footpath manhole, opened quickly on this busy Sunday afternoon. 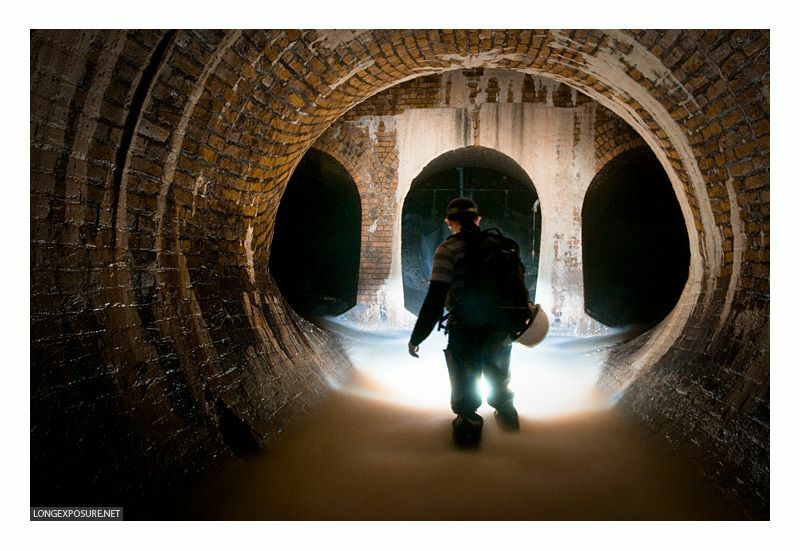 I climbed down first, and JD followed shortly after, and there we were – in what was once the river Westbourne, now a sewer under London. The smell was no worse than muddy Brisbane drains, but the noise… it roared loudly like nothing I’d expected. Following the short passage from the ladder shaft to the tunnel proper, we discovered a roiling, churning flow JD declared he had not before seen. The flow was fast and powerful, a grey highway of waste. The air was misty and thick. I breathed through my nose. Despite initial misgivings, we pressed up the brick tunnel, on the presumption that the level would drop further up, and we’d be spared the peril of this deep, strong flow. Within minutes, my thighs and ankles were burning, slogging against the heavy current. Footing was a constant issue on the slippery floor, and it didn’t do to consider too long the consequences of falling. With the current depth, going over would mean going under. Onward we struggled, at a remarkably slow pace, passing glorious brickwork features that I really couldn’t shoot. I tried placing my big tripod in the flow, and it just juddered and fell. No chance. We did find some respite early on, when we exited the flow to find the point at which the Serpentine River flows belowground. Mere metres in, however, the clear water was lost in effluent flow. JD and I continued up the tunnel toward a particular triple-arch feature, which would also provide us with an exit. Muscle fatigue was becoming an issue, and legs dragged numbly against the flow. This was like climbing stairs with weighted boots, and after a while, legs began to refuse to do as they were told. Keeping footing became more and more difficult. There were many close-call slipping moments, and I stayed upright all but one of those times. That other time, I went over sideways, and, well, saved myself from going over by plunging my arm into the flow at the side of the tunnel. My sleeve was soaked but I was otherwise spared. The latex glove on my hand kept my glove dry, in as much as I could tell. Much of my clothing was soaking in sweat by now, from the constant exertion, and I’m sure I smelled worse than the sewer did on its own. I nodded at a friendly rat that scampered impressively just above the flow, clinging to the encrusted brick walls. Finally, we reached the junction! A glorious triple-arched chamber, on the other side of which an exit awaited us. However, there was a problem. The flow was as strong as ever, with overflow pouring through each of the arches. While we contemplated our options, I decided to set up for a shot or two. The main problems shooting were that one simply couldn’t move around to light things up, and the camera couldn’t just be left sitting on its own. In the lull of a side tunnel, I set up the camera, stable enough at least for exposures, if not safe to leave, and JD and I swapped between lighting and camera duties until I’d managed to at least take an “I was here” shot. So, how to get out? We couldn’t even get into the chamber thanks to the churning flow that just pushed us back if we tried, and the exit on the other side would require swimming through sewage anyway. Another manhole shaft nearby was an option, though, but situated in a terribly busy location in the outside world. JD climbed the shaft, perhaps seven metres, but returned in dismay: cyclists were running across the manhole regularly, and chances were we were going to kill someone if we popped it. And, so, we started back the way we’d come. On the whole, it was a much quicker pace with the current, and in a short time we were back at a stone spiral staircase in the side of the tunnel, ancient and worn, caked with sediment. The manhole at the top, though, had not been opened in many a long year, and was not going to open for us, and so back into the flow it was, down to one other potential exit we’d passed. If this one didn’t work, we’d be going back all the way to our entry point. Thankfully, though, it did, and daylight and fresh air were much more liberating than I’d realised they would be. We emerged amongst picnickers, and crowds walking along a lake. The manhole slammed shut, we walked to the lake’s edge, watching the happy boaters, and I rinsed my big torch and tripod, as well as the feet of my waders. It was good to sit down. Leisurely, we wandered through the busy park, getting odd looks. It eventually occurred to me that we were sweaty and covered in filth. My poor backpack, which as been through a lot, was looking particularly worse for wear. I caught the tube back to St Pancras, knowing full well how sore I would be in the morning. 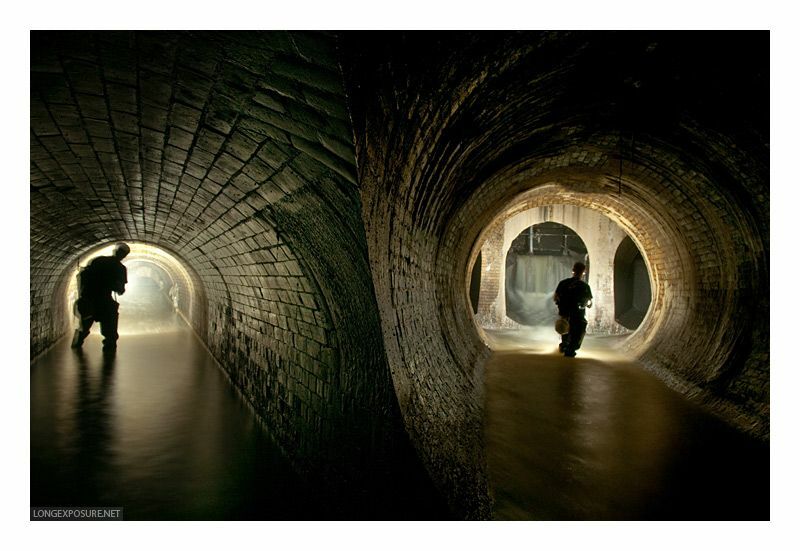 I stepped from the train, and walked through the maze of connecting tunnels, stairs, and escalators, until, a few minutes later, I finally emerged into daylight, and realised just how much exiting the tube complex reminded me of exiting the sewers. Take that as you will! Me thinks you do yourself a disservice by labelling any of these pics as ‘I was here’ shots, they’re great! Although it did make for an eventful and memorable experience I must apologise for my lack of foresight when selecting the location, considering the timing of our foray. It certainly was interesting to see that chamber overflowing to the extent it was. 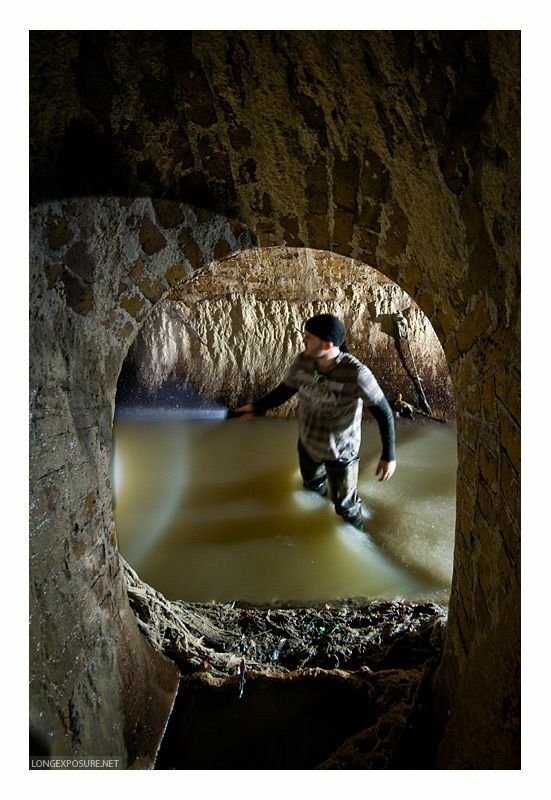 I think your last shot there gives a good idea of the amount and pace of the water flowing through; especially for those who know what usual late evening flows are like through that overflow tunnel. I haven’t sweated quite so much in a drain for a while, not surprising though for two hours walking to amount to a distance covered of one mile, I suppose you could compare the pace and effort required to that of wading through knee deep syrup. Of course with the added danger of slipping face first in to it and it not tasting so sweet. Look out, a bit of culture on LE.net! I like the top shot – it has a real “shine” to it :) Also love the super acute angle of the junction itself – knife edge! Brilliant writeup, I agree, the first photograph is composed amazingly, I almost thought you’d stuck two photos together. Next time you’re this side of the world, You should pop up Manchester way! great write up. you could almost taste the foul air – and feel the flow. good pics too. execllent from all points of view I’d say. Hey, I’ve loved your site for about a year now. Do you mind if I add it as a link on my site? Great read and pics. I’ve done the same walk you describe, and walking against the flow is indeed a leg muscle killer. It was the first bit of sewer walking either of us had done, so we assumed it was normal! Cheers again, I do like a good write up.